Vedantu.com - No.1 online tutoring company in India provides you Free PDF download of NCERT Solutions for Class 10 Maths Chapter 12 - Areas Related to Circles solved by Expert Teachers as per NCERT (CBSE) Book guidelines. All Areas Related to Circles Exercise Questions with Solutions to help you to revise complete Syllabus and Score More marks. Register for our free webinar class with best mathematics tutor in India. 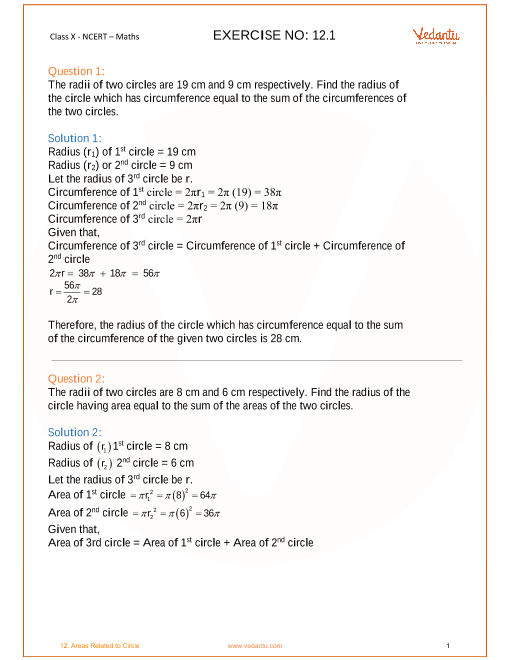 NCERT Grade 10 Mathematics Chapter 12, Areas Related to Circles is an extension of the concepts learnt in the previous grades while studying the Unit, Mensuration. A part of the same unit, this chapter begins the discussion with a review of the concepts of perimeter (circumference) and area of a circle and apply this knowledge in finding the areas of two special ‘parts’ of a circular region (or briefly of a circle) known as sector and segment. How to find the areas of some combinations of plane figures involving circles or their parts shall be learnt through this chapter. Perimeter and Area of a Circle — A Review, Areas of Sector and Segment of a Circle and Areas of Combinations of Plane Figures are some of the main concepts learnt in this chapter. New concepts, interesting problems, solved and unsolved examples and simple language, make NCERT Grade 10 Mathematics Chapter 12, Areas Related to Circles interesting and fun to learn. Summary, Daily life examples and exercises help the students to dive into the world of Mensuration with a throttle and master the topic. Pictorial representation makes the chapter more interactive and clears the concepts in a better and comprehensive manner. This chapter will help the students to strengthen their foundation on Areas Related to Circles to deal with further complex topics meritoriously. With an in-depth study of this chapter and solving the problems will help the students to solve complex problems easily. This topic will help the students to build a strong foundation for the topic, Areas Related to Circles. A part of the Unit, Mensuration; this Unit holds a total weightage of 10 marks in the final examination. Get 100 percent accurate NCERT Solutions for Class 10 Maths Chapter 12 (Areas Related To Circles) solved by expert Maths teachers. We provide step by step solutions for the questions given in class 10 maths textbook as per CBSE Board guidelines from the latest NCERT book for class 10 maths. The topics and sub-topics in Chapter 12 Areas Related To Circles are given below. Other than given exercises, you should also practice all the solved examples given in the book to clear your concepts on Areas Related To Circles. Download the free PDF of Chapter 12 Areas Related To Circles and take the print out to keep it handy for your exam preparation.